Per their website: CancerCare for Kids provides free counseling services to children who are facing the challenges of a cancer diagnosis—either their own or that of a parent, sibling or other family member. It's a great event and LuxSugar is very excited to be a part of it. * For the contest leave a comment on the contest 'Fling Up' proclaiming what your favorite cupcake on the menu is and why. 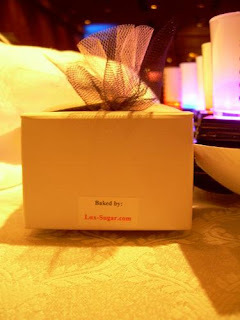 * The LuxSugar ladies will pick the most creative comment and the winner will receive one dozen minis! * Once again twitter is allowed, you must twitter your answer and provide a link to our contest to be eligible. Please let us know if you do this so we can keep track.The contest will run until next Tuesday at midnight MST. 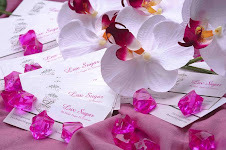 So make sure you go on fling it girl and check out fling it girl's blog on LuxSugar and enter the contest!! We will post the winner's name next week!! We probably won't be at the fleas until October. But if you are aching for some LuxSugar call us at (718)512-4LUX or e-mail us at: lux-sugar@desserts.com and we'll be happy to oblige! Here are some pics from the Emmy's Party that occured on Sunday and from the BK Flea Market in Fort Greene. 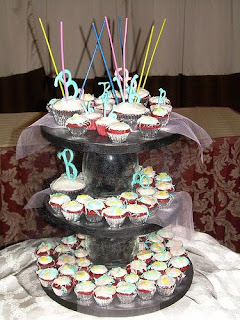 The sweet 16 we catered on Saturday was a huge SUCCESS!! We debuted the grafitti cupcake which matched the birthday girl's theme to a T! 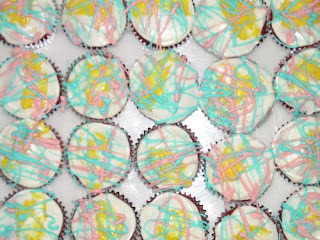 125 Grafitti cupcake favors, boxed, tied with tulle and a thank-you card attached. Closeup on party favor box. A "Graffiti" red velvet cupcake nestled inside. 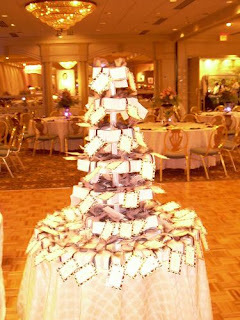 We are catering a huge Sweet 16 event for a really sweet girl, Briana in NJ on Saturday 9.13.08. On the Menu: 125 red velvet cupcake as favors and 5 dozen mini's to be displayed on a cupcake tower to match Briana's party colors. Look out for the official pics by the end of the weekend. 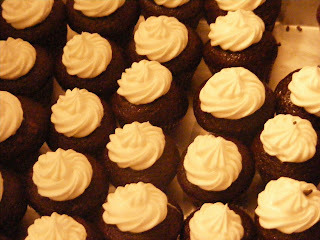 As for cupcake and other goodie updates: Catch us at the BK Flea on Sunday 9.14.08. The menu will be posted on Friday. 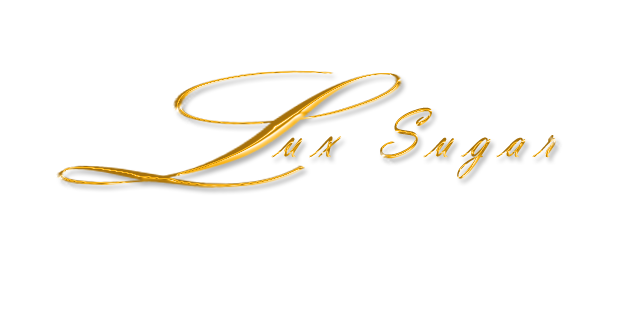 Be on the lookout for a new and improved LuxSugar blog site coming soon. 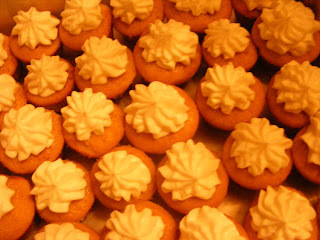 desserts@lux-sugar.com or call us at: 718-512-4LUX. Well summer is almost officially over :-(...but it was a great Lux Summer. We catered a slew of great parties such as Saks Fifth Avenue, Sephora's Sara Biria, K. Anderson PR, and many many other fun parties. We also had a great time at all the fleas this summer as we met alot of our great clientele in both Fort Greene and Williamsburg. Along with the bakers staying busy in the kitchen w/ the numerous orders Lux has been getting, we have been brainstorming on what we will debut this fall...so stay tuned for that announcement. We wanted to thank Noreylee or as we like to call her, N.O.R.E. (lol) for the great pics she took at the BK flea this summer. Check out the red velvet mini and the halle mini on her flickr account. We are going to cater a Entourage party on Sunday (one of our fave tv shows) and we will be super busy this weekend with a tasting/consultation for a huge Sweet 16 Birthday Party that will take place this month, and other orders for cakes and other goodies. Don't forget to check the calendar on Luxsugar website for our scheduled dates at the BK flea for September.